A sheriff in far-West Texas ordered his deputies not to accept off-duty work requests to protect a children’s shelter operated by the Department of Homeland Security (DHS). The shelter reportedly houses Unaccompanied Alien Children who crossed the border without a parent or guardian. 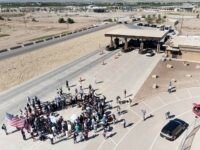 A tent city in Tornillo, Texas, that Democrats have been using as a site for protests against President Donald Trump’s border policies turns out not to be housing children separated from their parents after all, according to the Austin American-Statesman.